Rats have a fairly specialized diet. Many people make the mistake of feeding them commercial hamster and/or parrot feed. This however, is a very quick way to place your rat in extreme discomfort and medical risk. These feeds tend to have very high levels of protein, which can cause allergic reactions in rats and result in a compromised immune system, which could lead to respiratory infection, mite infestations and other unwanted side-effects. 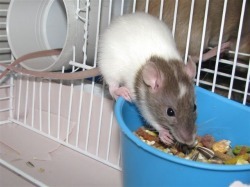 Ideally, the protein in your rats' diet should not exceed 18%. 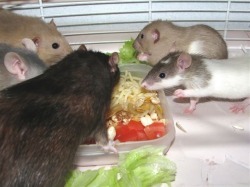 The general rule of thumb is that if it's good to eat for you, it's fine to feed your rats. Raw dry beans or peanuts - contains antinutrients that destroy vitamin A and enzymes needed to digest protein and starches, and causes red blood cells to clump. Raw sweet potato - contains compounds that form cyanide in the stomach. Green potato skin and eyes - contain solanine, a toxin. Raw bulk tofu - can contain bacteria, packaged raw tofu is safe. Orange juice - forbidden for male rats only because d-limonene in the skin oil, which gets into the orange juice during squeezing, can cause kidney damage and kidney cancer due to a protein that only male rats have in their kidneys. Pieces of orange fruit are okay if you make sure all pieces of peel have been removed. Carbonated beverages - rats can't burp. Dried corn can contain high levels of fungal contaminates which has been shown to cause liver cancer in rats. Corn also contains high levels of both nitrates and amines. These two compounds can combine in the stomach to form nitrosamines which are carcinogenic. Other foods high in nitrates include: beets. celery, eggplant, lettuce, cucunber, radishes, spinach, collards and turnip greens. Some fresh corn is fine, but if you feed your rats blocks, try to avoid brands which have corn as the first ingredient. Blue Cheese - contains toxic mold. 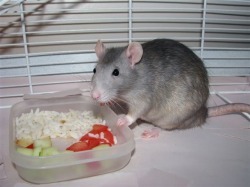 Remember to always have fresh food and water available to your rats.